Outside waiting area of Raleigh Station. January 2018. 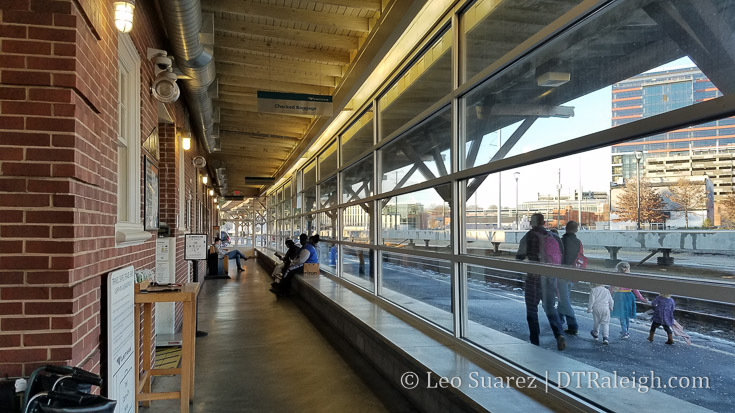 With the opening of Raleigh Union Station only a few months away, I just had to capture the look and feel of Raleigh Station, our current train station on Cabarrus Street. 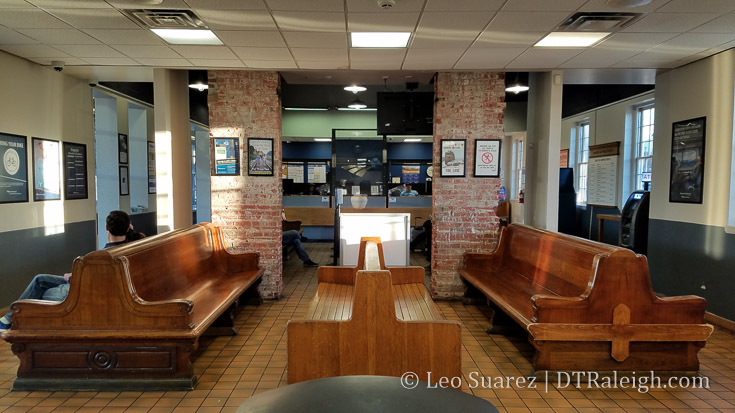 This post is basically just a bunch of photos for posterity to show the station that has served Raleigh since 1950. If you can make it down there in the next month or two, it is such a drastic difference between the upcoming station and the current one. It really feels like Raleigh leapfrogged our next train project and just went two levels higher instead. 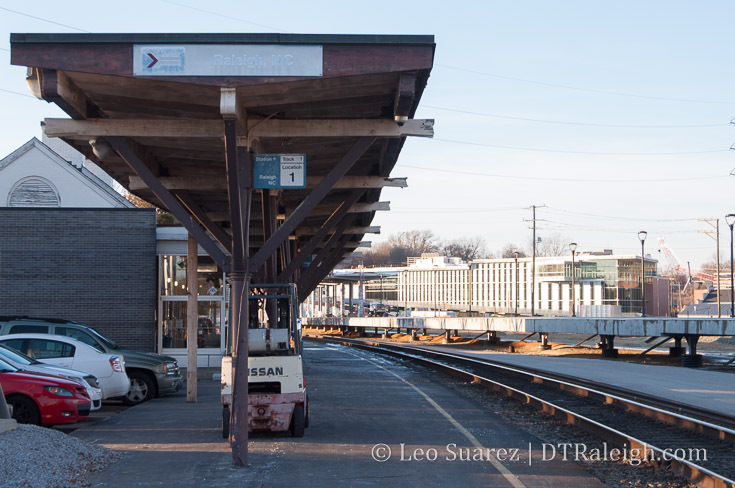 The splintering wood, the rusty metal, and the washed out signs basically show a station that has reached its end-of-life. The interior is nothing but functional however you can’t help but admire the downtown view. I’ll be referring to this post in the future but for now, enjoy the photos. Google maps aerial of Raleigh Station. Exterior of Raleigh Station. January 2018. Interior of Raleigh Station. January 2018. 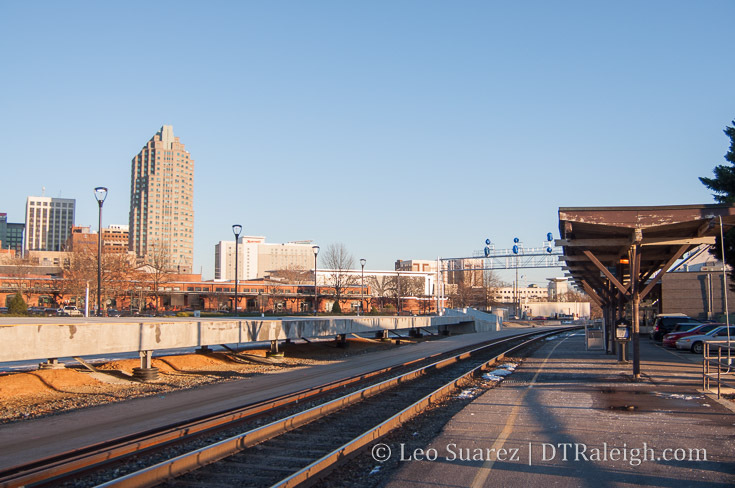 Skyline view from the boarding area of Raleigh Station. January 2018. 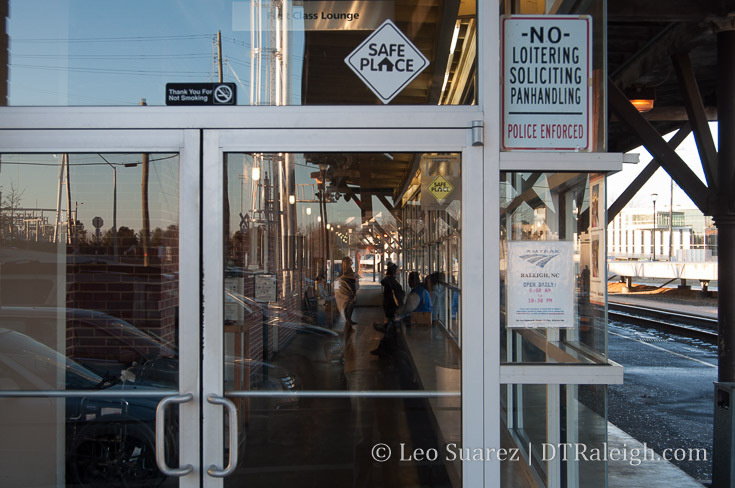 Signs of Raleigh Station. January 2018. 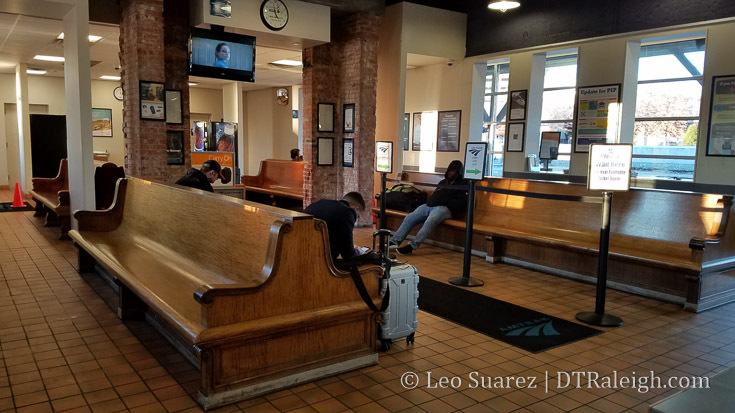 Boarding area of Raleigh Station. January 2018. 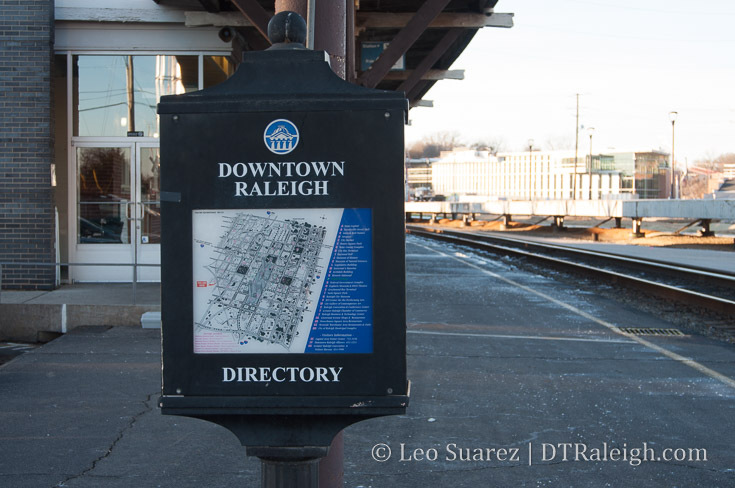 An out-of-date map of downtown Raleigh outside of Raleigh Station. January 2018. One of the entrances to Raleigh Station. January 2018. 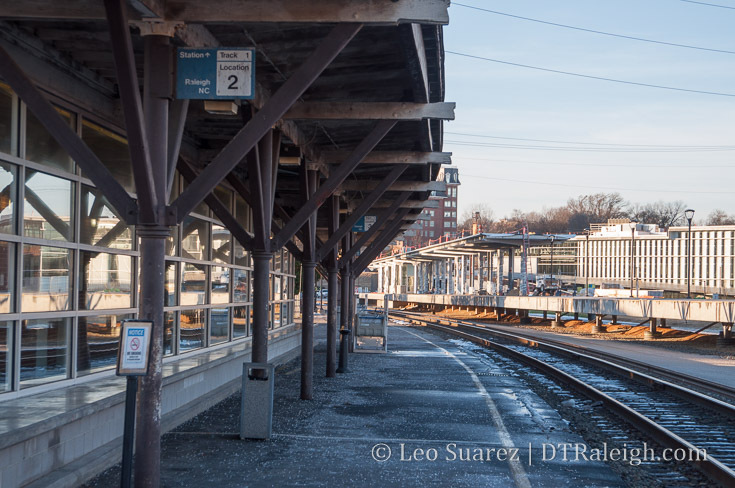 Current boarding area of Raleigh Station with new platforms for Raleigh Union Station in the background. January 2018. Boarding areas of Raleigh Station. January 2018. 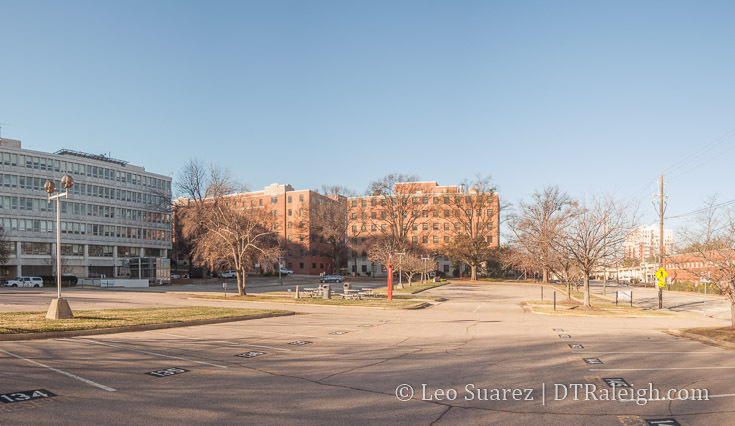 Caswell Square has made the news recently as a piece of the state-owned land is being considered to be sold to a private developer. 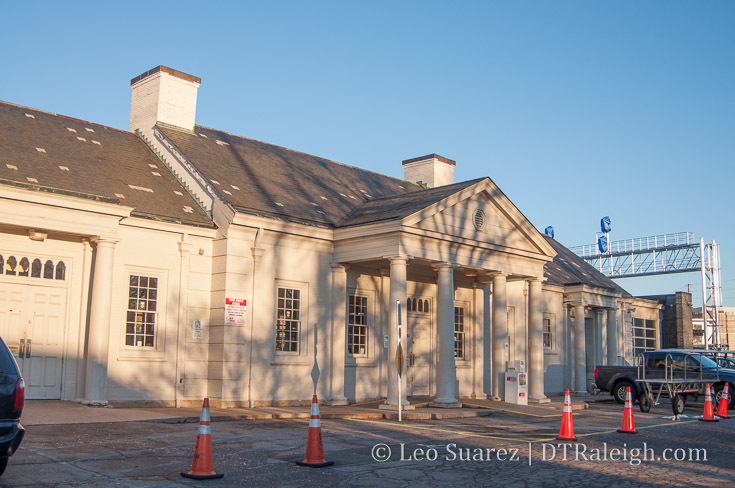 A few buildings on the square are planning to be renovated for medical offices. The North Carolina Council of State needs to approve the sale of these properties. At first, it doesn’t sound like a big deal but if you aren’t familiar with Caswell Square then allow me to inform you. Caswell Square is one of the original squares of the William Christmas plan. This plan laid out the street network for Raleigh and was to include five public squares, owned by the state. 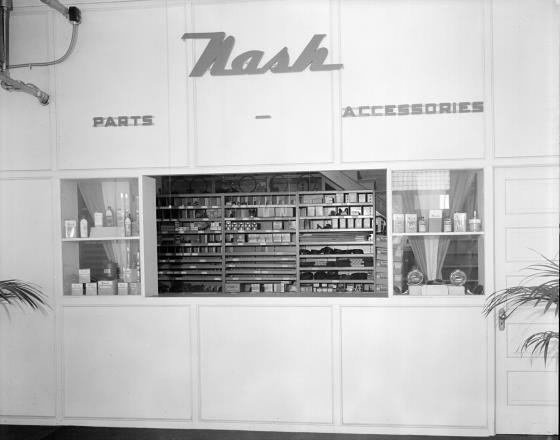 You almost certainly have heard of Nash and Moore Square, operating as parks today, and also Union Square, where the historic North Carolina Capitol building sits. Lesser known Burke Square has the Governor’s Mansion, also called the Executive Mansion, and finally, Caswell Square. Bounded by Lane and Jones Streets to the North and South, McDowell and Dawson to the East and West, Caswell Square, for over 100 years, has had state government buildings on it. The entire block is now consumed by buildings and surface parking. Some of those buildings are even empty and boarded up. Still owned by the state, they sit waiting to be torn down or for renovation work to take place. 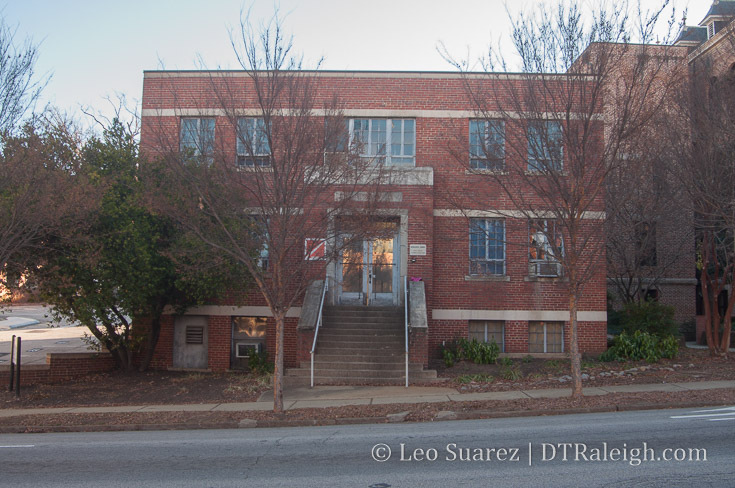 As part of the Governor’s plan, called Project Phoenix, to revitalize the state government complex in downtown Raleigh, a portion of Caswell Square, owned by the state since the birth of Raleigh in 1792, is up for sale for private use. Plans for medical offices in now empty buildings are on the table as millions of dollars in renovations would take place in the old buildings on the square. The sale would generate $1.75 million to the state. 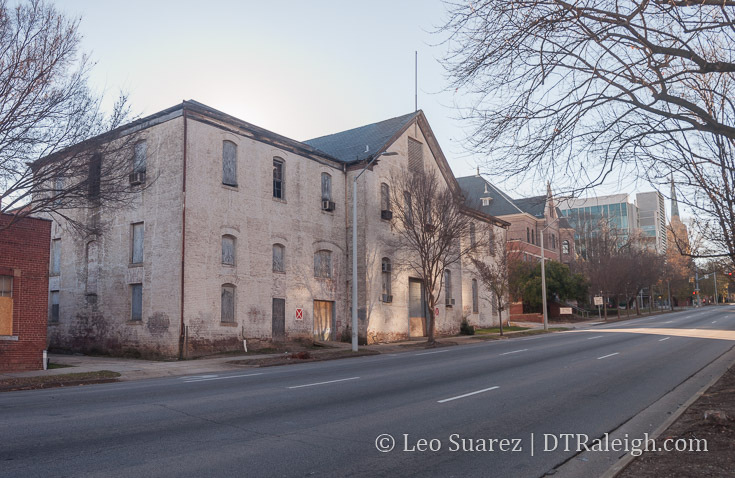 Preservationists have come forward and claimed that the state should not offload the historic piece of property as it dates back to the original plan of Raleigh, the Christmas plan. 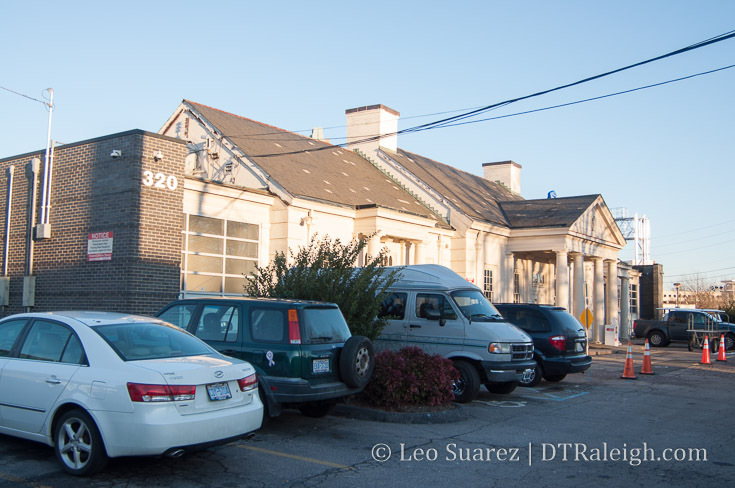 Below, are the three empty buildings being discussed for sale. They are located primarily along Dawson Street, next to each other, starting from the corner of Dawson and Lane. For me, I’ve been a huge supporter of the ideas in Project Phoenix but this one makes me pause. Offices can go anywhere but public squares aren’t being planned anymore. I’m not sure I agree with those that want to sell of parts of Caswell Square. To the east and south of the square, the properties today are largely dominated by state government properties, mainly offices and museums. The museums are a relatively new addition compared to most of the other offices, having been there for decades. 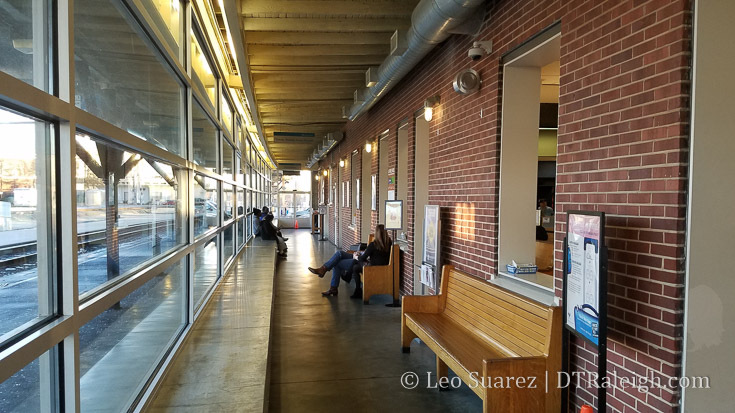 A mix of commercial activity exists to the east and north of Caswell Square including law offices, the Days Inn hotel, Babylon restaurant, and other office space. I would consider this very small scale. Edenton Street United Methodist Church has also owned land, been a presence nearby for quite some time. The eastern edges of Glenwood South and the state museums are basically the new, the momentum, with the church and state government offices being the old, the legacy downtown. They are starting to mix and this brings us to Caswell Square, stuck in the middle. 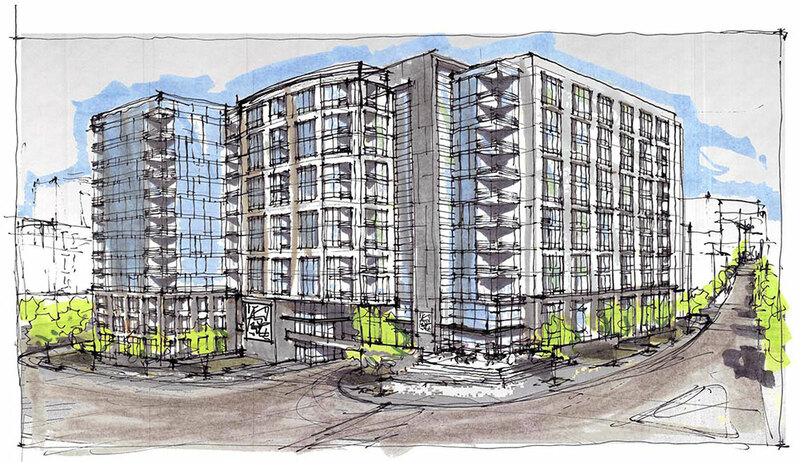 We don’t know yet the impact of Glenwood South and how much it’s success could cause more development to the east. 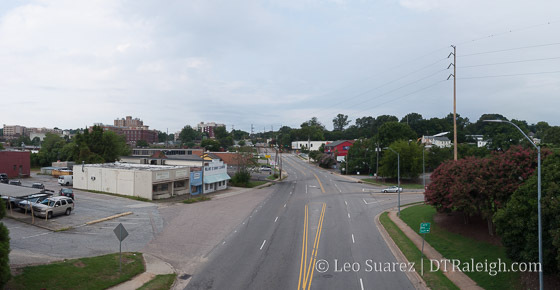 Hillsborough Street projects, with 301 Hillsborough being close by, could also impact uses at Caswell Square in the future. Work on Project Phoenix within the government complex could create new uses for Caswell Square. You also have all the work taking place along Capital Boulevard and the square loop at Peace Street. Caswell Square historical asset, the NC School for the Blind and Deaf. Read more about it on Goodnight, Raleigh. 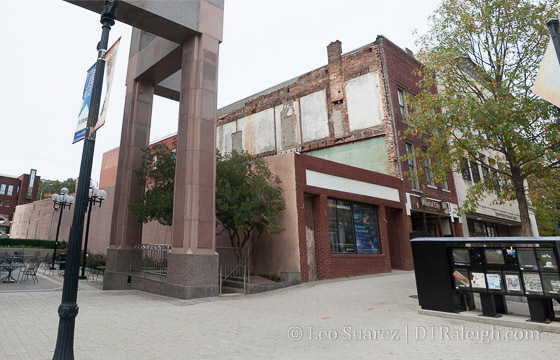 In my opinion, the future is bright for downtown and taking this opportunity to sell off a historic piece of land for a cool $1.75 million isn’t the right way to go. In the 1950s and 1960s, when the state government complex was built, lots of land was acquired, some with eminent domain. I’d like to see some of that land sold back to private hands for reuse first before even thinking of carving up a major piece of Raleigh history. 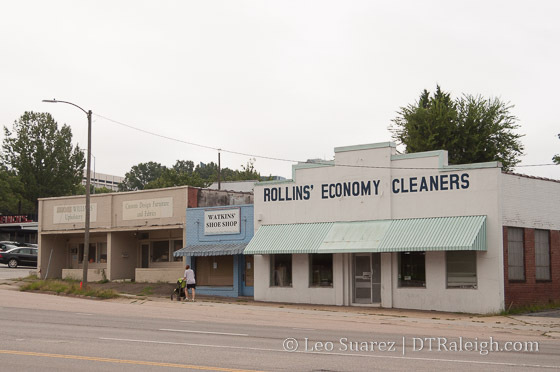 I’m not sure I’ll see the day but I’d like to see the state government clean up and efficiently use the properties with no historical significance, the northern end of downtown, before they start discarding history. NC State offices in the Caswell Building at the corner of McDowell and Jones Streets. Instead of immediate gains, I’d like to see the state, partnering with Raleigh, to use Caswell Square as a way to boost nearby activity. It just so happens you have a top 5 visited attraction, the N.C. Museum of Natural Sciences, in the state nearby to the square. 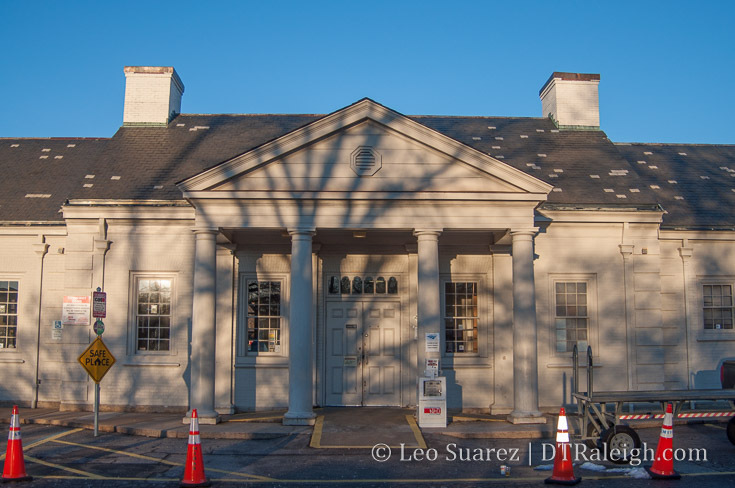 With the Nature Research Center recently completed, maybe a park extension in Caswell Square could boost the museum’s profile and bring more tourism to the area. Surface parking around NC State government buildings. To the east of Caswell Square sits a massive surface parking lot. Parking consolidation is easily a project that the state should undertake, freeing up new land for either more office buildings (mixed-use office buildings by the way) or to be sold for private use. Ideas like these could have long-term benefits that if done well, could bring the state much more than $1.75 million. The discussion to sell the land was on the agenda for the Council of State last week but a decision was delayed until a future meeting. What would it take for a Raleigh neighborhood of the 1900s that was completely wiped out, literally paved over, to come back? It seems naming a new development in the 2000s after it would be a start. 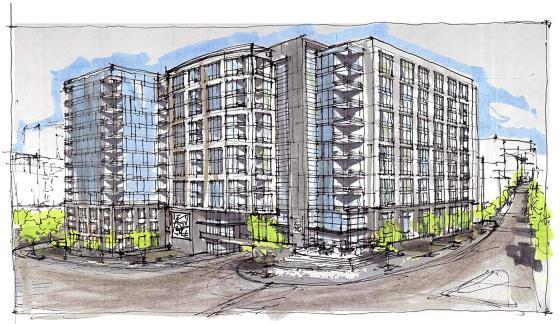 The Smokey Hollow project will be a 12-story mixed-use project with 400 (400+ actually) apartments and retail according to the press release and recently submitted site plans. The press release doesn’t call out the name Smokey Hollow but the site plans on the city’s website are named just that. Now that I’ve got that out of my system, I’d like to dive back into the history of the area and how Smoky Hollow was cleared out by the State of North Carolina and their drive for what was called “urban renewal” in the 1950s and 1960s. As part of a former project (Link Peace Street) that I was a part of, active in 2012, I have polished off this Google Map for reuse. Below is the map containing the old Smoky Hollow boundaries as well as former streets. There are also historic and present day photos. 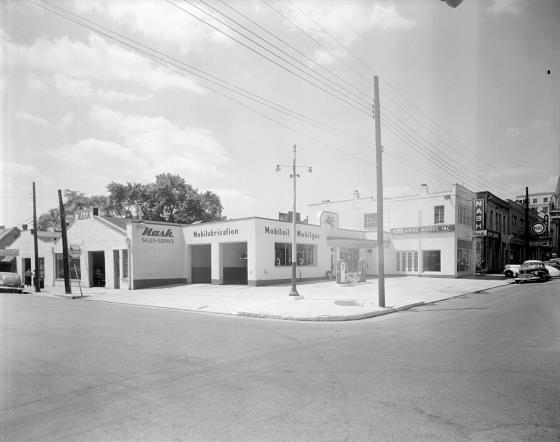 As for the history of the neighborhood, Anna at her blog Reinvent Your Wheel has a great take on the area’s change in her blog post, “Capital Blvd: Raleigh’s Great Divide.” I’m posting a piece of the post with permission. Smoky Hollow (which I’ve also seen spelled as “Smokey” Hollow) was a blue-collar neighborhood in downtown Raleigh prior to the construction of Capital Blvd in the 1950s. Everything I’ve found hints the it was a racially mixed area with both black and white residents which would have been somewhat unique to that time period. Its boundaries were roughly Peace St to the north, West St to the west, North St to the south and Wilmington St to the east. The residents of Smoky Hollow worked primarily for the railroad, mill, or other industrial businesses in the vicinity. Children growing up in Smoky Hollow entertained themselves by playing on the train trestles and in the Pigeon House Branch creek, which has now been mostly buried. It was a solid community although it seems like it was considered to have been a little rough around the edges. 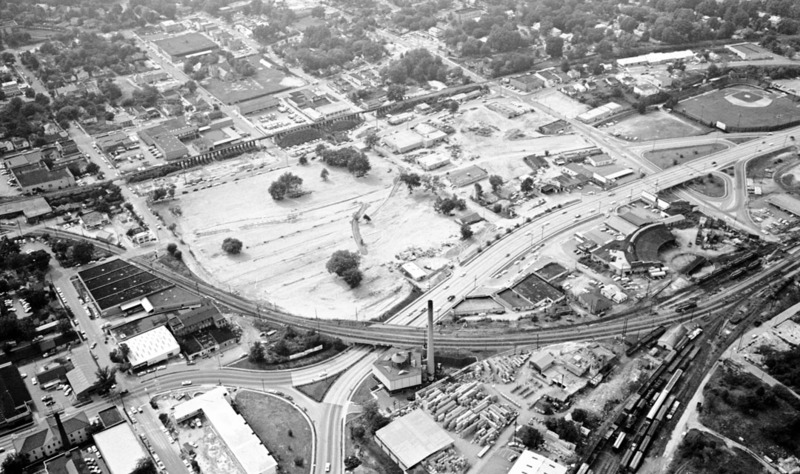 The construction of Capital Blvd, with the addition of other projects, brought about the end this unique piece of downtown by the early 1960s when almost all the residents were forces to relocate. Only a few pieces of the Smoky Hollow neighborhood remain, including Finch’s Diner on Peace St and the store fronts found to the west of it. Anna’s post also has a pair of maps, showing the before and after effects of Capital Boulevard punching through the Smoky Hollow neighborhood. In short, a grid of streets was removed resulting in two anti-urban hits to downtown Raleigh; a fast moving highway and the state government complex. A neighborhood faded away as well as a baseball park. 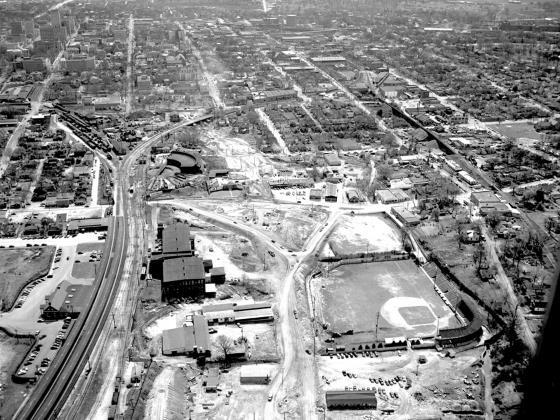 The Devereux Meadow ballpark, which has been mentioned on this blog before, predates capital boulevard, as shown in this 1952 aerial photo taken by the News & Observer. Reprinted with permission from The News & Observer. Click for larger. This photo shows Capital Boulevard (then known as Downtown Boulevard) under construction in 1952 or so. The project was finished in 1953. The view is looking south. This photo shows the intersection of Peace Street and Capital Boulevard. The ramps for the bridge have been graded. Devereux Meadow ballpark is in the foreground and across the left field fence is the Raleigh Cotton Mill. 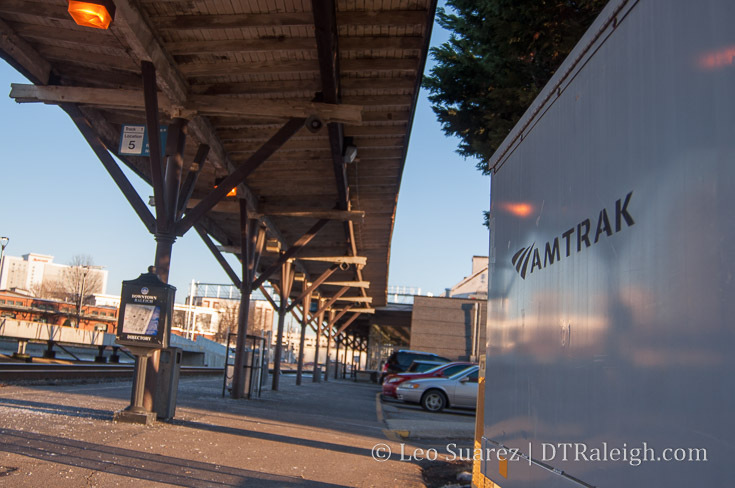 Across the railroad tracks from the mill is the Seaboard Passenger station. 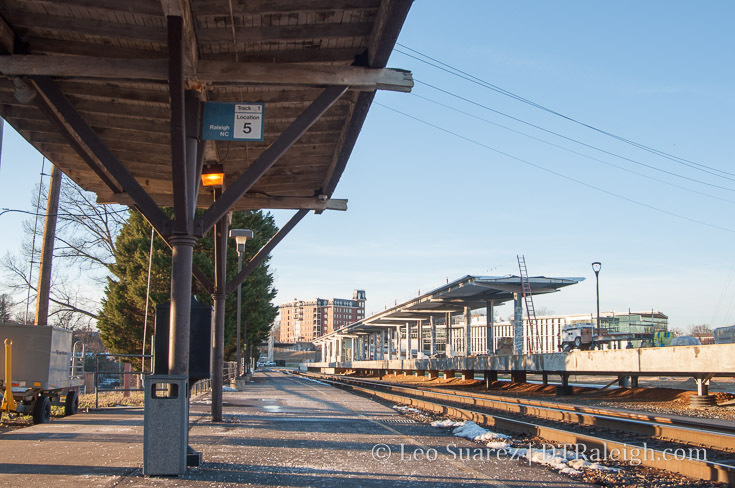 In the center is the Seaboard half-roundhouse adjacent to the rail yards. To the right of the roundhouse is Finch’s with cars parked in front. To the right of Finch’s is a collection of storefronts including the dry cleaning building. These are among only a handful of buildings still standing in the former Smoky Hollow neighborhood. 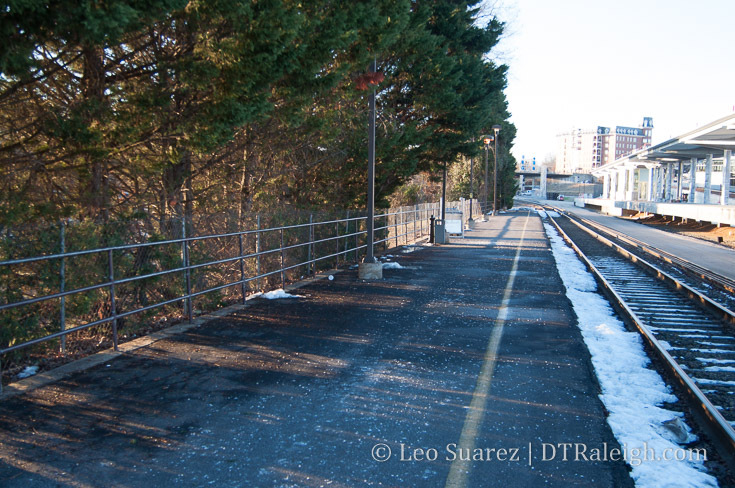 At the right, you can see the Norfolk Southern tracks and trestles including the one that passes over Peace Street. The boundaries of Smoky Hollow were basically that area between the Seaboard railroad yards and the Norfolk Southern Railroad tracks, and between North and Peace streets. *Historical research by Karl Larson, History Editor, Goodnight Raleigh. Let me add that you can still see some of the Smoky Hollow houses along West and Harrington Street. 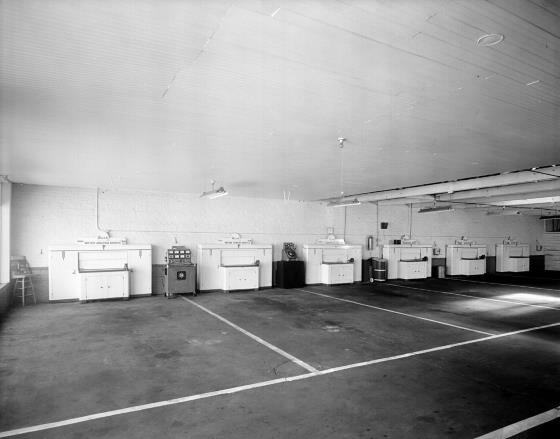 The finished product can be seen below in this November 1964 photo, again from the News & Observer. The neighborhood is gone at this point. Over time, the area has filled in, mostly with state and county-owned properties. Economic development? I’m not convinced that was a successful result of the Capital Boulevard project of the 1960s. Moving to the present, the original area of Smoky Hollow hasn’t seen any real movement lately except for the West at North tower. Located at, you guessed it, West and North Street the 17-story residential building opened in 2008 and is probably the anchor to any West Street activity near Glenwood South. With a lot coming to West Street, the announcement of the Smokey Hollow project, artist’s sketch below, shows that we may be putting the pieces in place to bring back residential to Smoky Hollow once again. It may not look the same as 75 years ago but the Smoky Hollow of the future may exist in mid-rise apartments with ground floor retail. In a future post, let’s take a look at some of the factors supporting this residential drive in Smoky Hollow. The pieces are all there including a creek, a new park, and calmer, better connected streets. 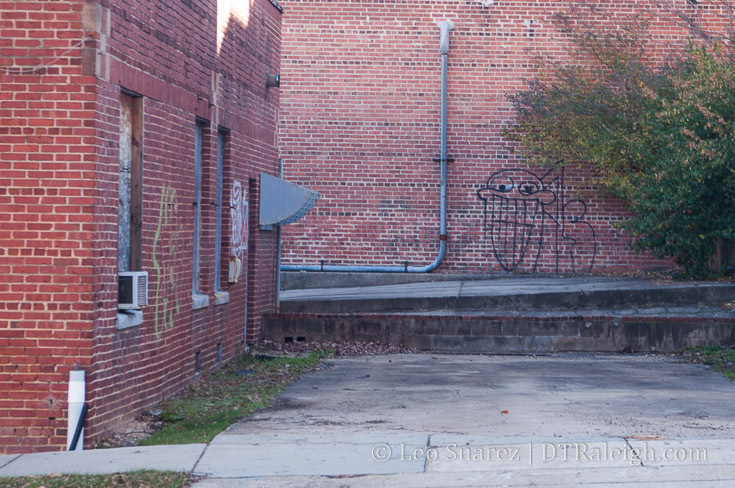 I hadn’t really thought much about what was going on at 114 Fayetteville Street until recently. I walked by and noticed that the second and third floors have been removed. In the last ten years this building has been tinkered with so much but produced nothing. At one point, the facade was white with a different window layout. 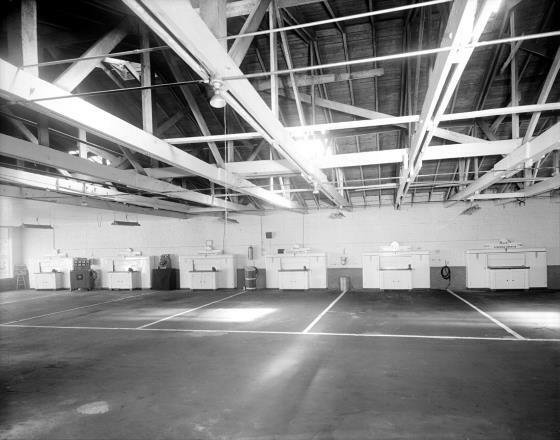 In 2006, the building was empty. Then sometime in 2007, scaffolding went up, the bricks were painted red (or replaced?) and new windows went in. Which produced this look. Still, no occupants. That didn’t seem to work and now 114 Fayetteville is a single-story building. What will happen next? If you jump all the way back to about 1926, 114 Fayetteville Street was different back then too. 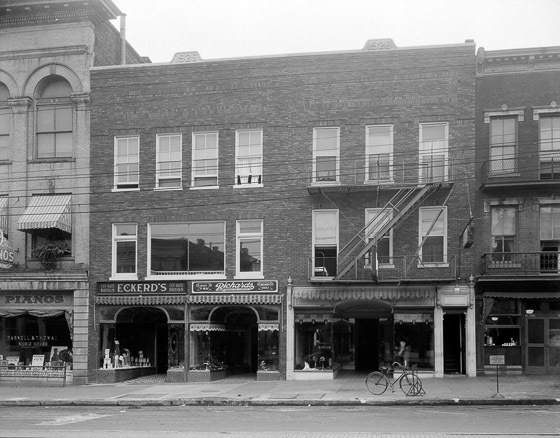 At the time, an Eckerd’s Drug Store, in addition to other shops, occupied the bottom store. 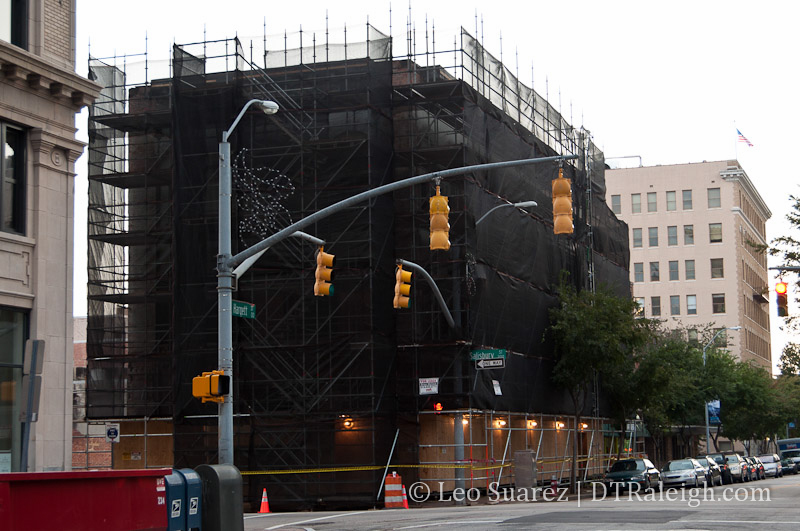 At the corner of Morgan and Blount Streets, there is a lot of renovation work taking place. The formerly quiet corner is being turned into a church. It’s not just ‘another church’ as some may be quick to judge but rather a space that is dynamic and can be used as the community sees fit. After taking a hardhat tour with the leader behind this new effort, Justin Morgan, there’s something unique going on here. The group is working with In Situ Studio to really make this place stand out. 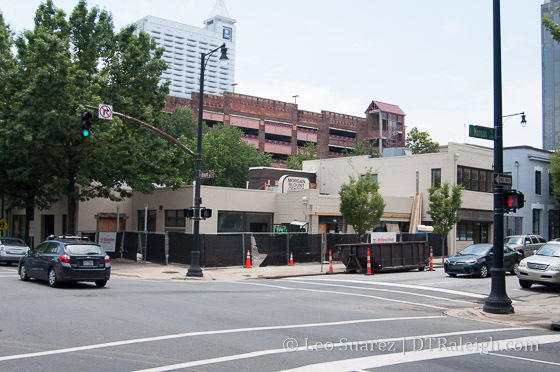 Called Church on Morgan, no relation with Justin’s last name but rather the street, this space is being planned to directly serve the downtown Raleigh and surrounding areas. It’s an extension of the Edenton Street United Methodist Church, which you may be familiar with their historic location at the corner of Edenton and Dawson Streets. The new space is a response from Edenton Street United Methodist to serve and engage with downtown. The location has significance as well. The congregation here believes that the power of food can really bring people together for good and as such the place is envisioned to be a hub for Second Saturday, a monthly event that takes place along the Raleigh Food Corridor. While some folks may prefer the traditional approach to prayer, Church on Morgan’s approach is different. In addition to food, entrepreneurship, supporting local community, and gathering are also key elements. They told me that they are here to support people with ideas who need a space to try them out. 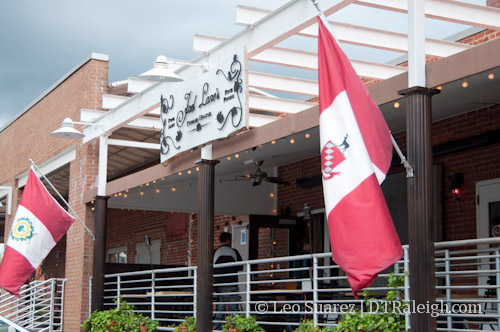 For example, the outdoor patio is built so a food truck can roll up and serve. Wifi isn’t private, it’s a public resource for those that show up. The idea is to tailor the space for a growing demographic, the urban demographic that Raleigh is acquiring over the years. You may see Church on Morgan hold tech events, pop-up food vendors, or even neighborhood meetings from those that live nearby. I am not a member of the Edenton Street United Methodist but when I heard about this project, I became intrigued and love the idea of them helping create “collisions” in downtown. By collision, I mean where people are brought together and form relationships around common interests. That’s how you build community and teams that are set to do good around the neighborhoods we live in. 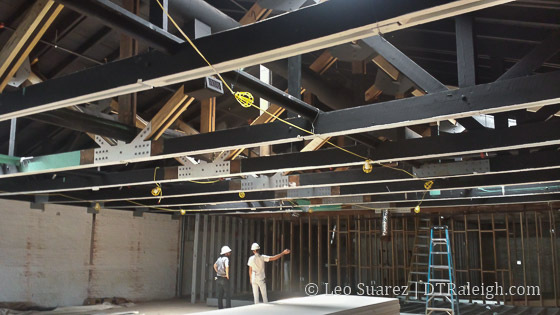 Church on Morgan plans to open in October and will be an active part of First Fridays. I encourage you to stop by. In addition to hearing about the story, I asked for a little history of that corner. The project includes three distinct buildings. The two-story building on Morgan Street where H&R Block used to be. The office building on the corner that used to be a gas station. 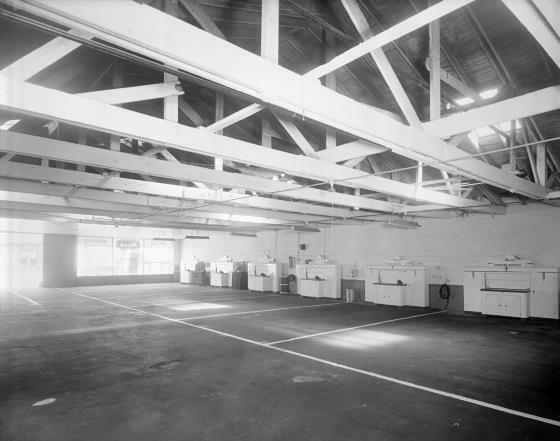 The attached warehouse building along Blount Street. Church on Morgan will flow between all three of these buildings and very little additions are being added. Other than some entrance/exit changes and a new outdoor patio on the corner, the buildings should look the same even with a new paint job. 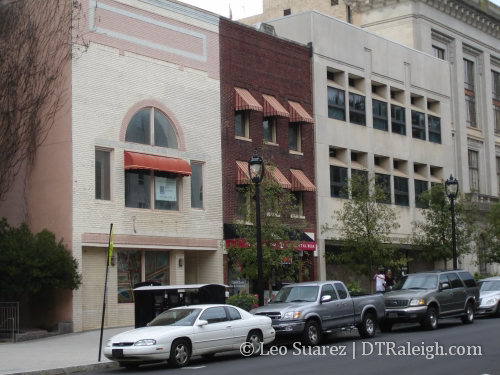 This corner of Raleigh was very automotive heavy in the first half of the 20th century. 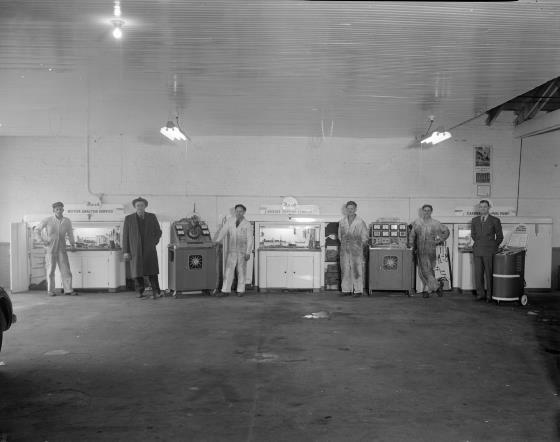 Car dealerships, gas stations, and repair shops clustered the area. 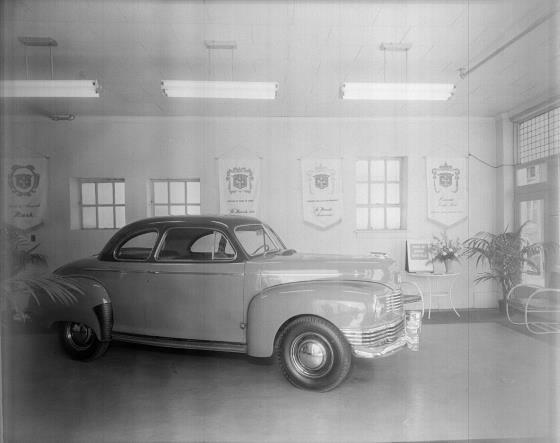 All photos below come courtesy of the State Archives of North Carolina. “Raleigh’s Second Renaissance” has been a wildly trending phrase since the DRA’s 2014 State of Downtown in mid-April. 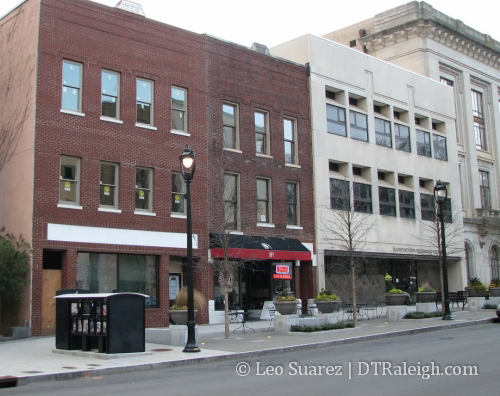 Raleigh is indeed experiencing a new chapter of development. As much excitement that a renaissance can bring, it can be equally as daunting. We must make decisions that will affect our overall quality of life. On May 3rd and 4th, Raleigh will be celebrating its inaugural Jane’s Walk to encourage open conversations about the city’s development. Jane’s Walk is a global initiative honoring urban activist Jane Jacobs’ birthday. It is designed to promote urban literacy through locally lead neighborhood walking tours, each focusing on a different theme. 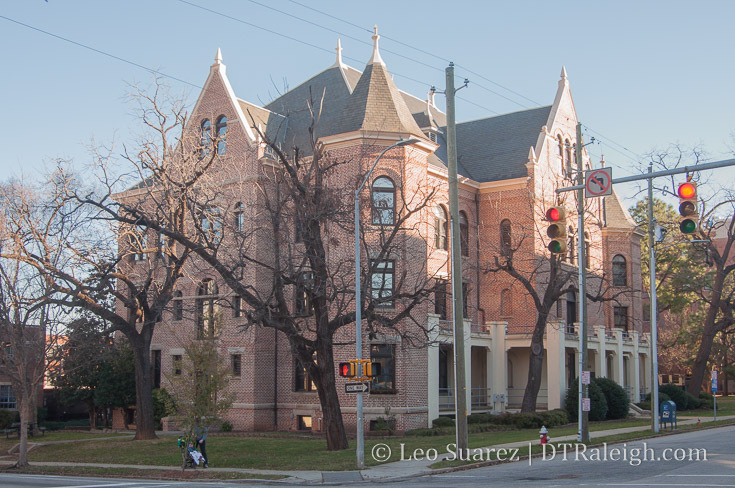 As part of the event, I will be facilitating the DTR History of Commerce Tour. We will stop at 10 different landmarks starting at the COR Museum on May 3rd at noon. I’ve found that evidence of Raleigh’s resilience in the face of challenges can be extrapolated from our commercial architecture. 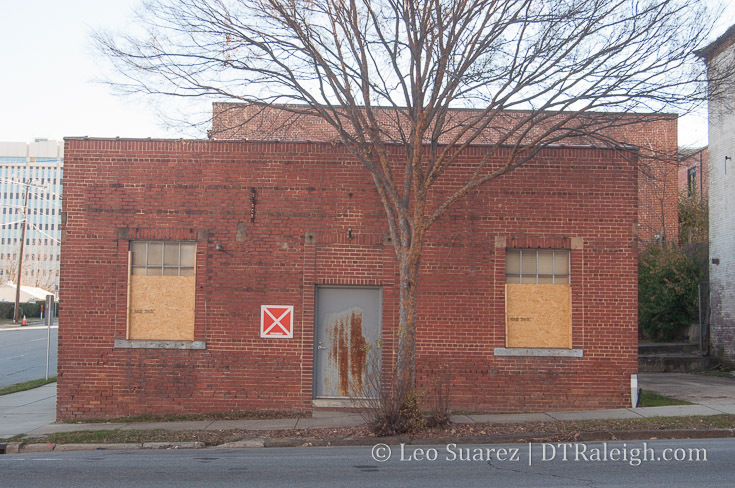 One fundamental example of this is Fayetteville Street’s beloved Briggs Hardware Building. Thomas Briggs inspired our young epicenter during the Reconstruction Era by opening up the city’s first skyscraper for his shop in 1874. The subtle Art Deco style that The Raleigh Building features remind us of our ability to overcome the Great Depression. 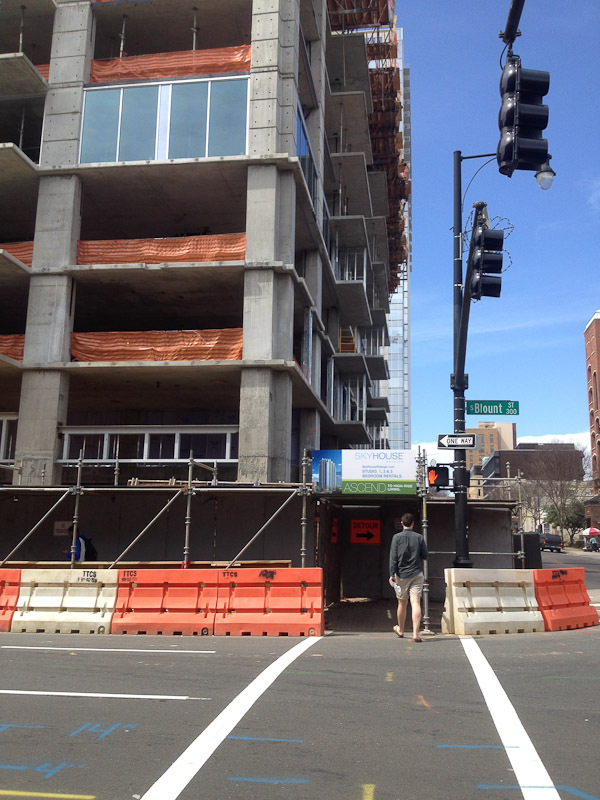 Soon, SkyHouse will be erected on the corner of Martin and Blount Streets as a symbol of Raleigh’s Second Renaissance! During my free time, I jot down thoughts about my concerned citizenship on my blog. Usually, my curiosity leads me to wanting to know more about what came before us. 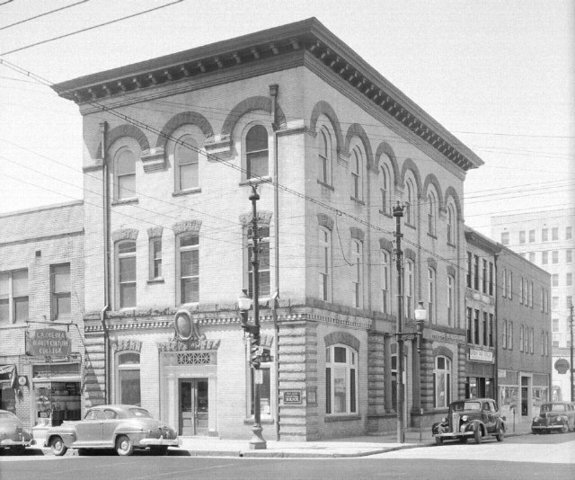 What I’ve learned from researching downtown’s history is that we have endured a lot! 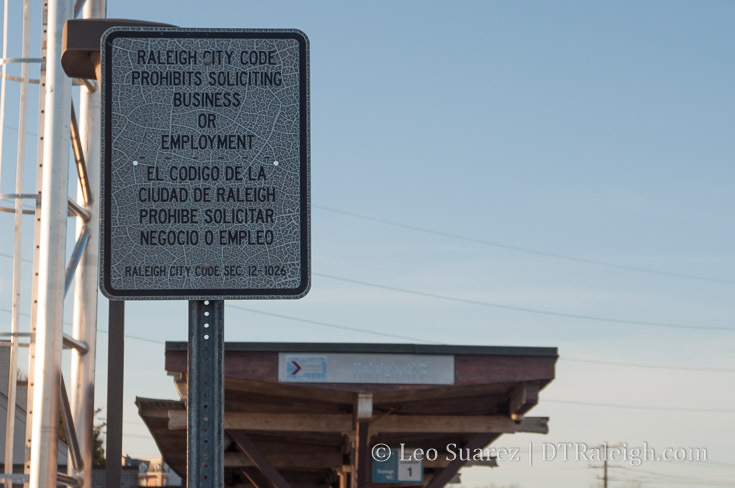 Since becoming the capital of the “Rip Van Winkle State”, Raleigh has survived population growth spurts, wars, economic downfalls, and civil rights movements. 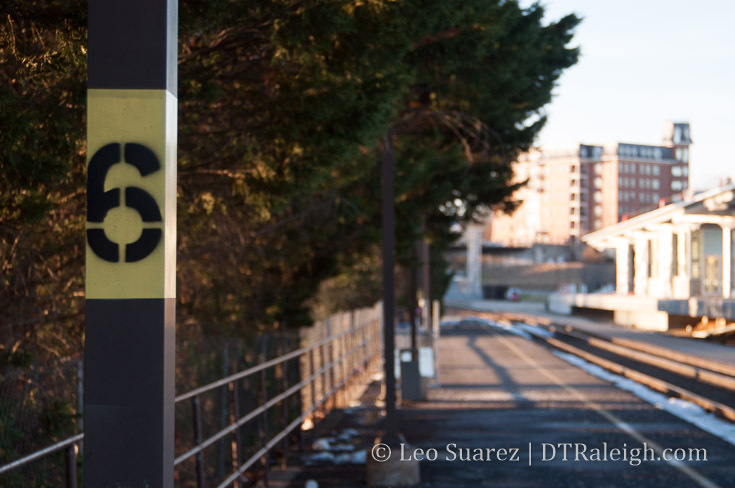 For a small, often overshadowed, Southern city, I’m intrigued with how these milestones affect the wax and wane of Raleigh’s development. Please join me in discussing examples of our resilience and transformation during Jane’s Walk. Our outgoing Chief Planning & Development Officer, Mitchell Silver, will also be leading a walk starting in Nash Square at 1:30pm. On Sunday, May 4th at 2pm, I invite you to follow urban instigator, Matt Tomasulo, as he explores the opportunities of Dix Park. Jane’s Walk is coming to our city at the perfect time and is sure to be full of inspiration. 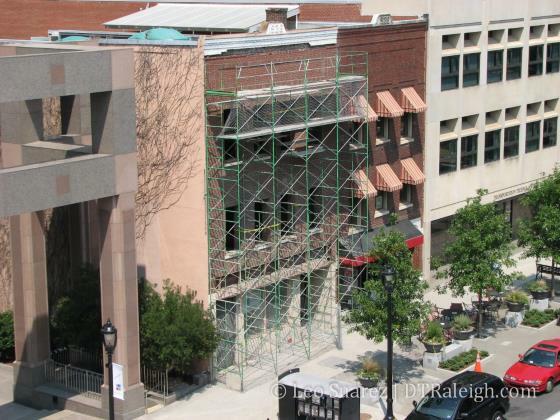 Now, workers are pulling down that skin, revealing what developer James A. Goodnight hopes will become a striking historic piece of Raleigh’s revitalizing downtown. 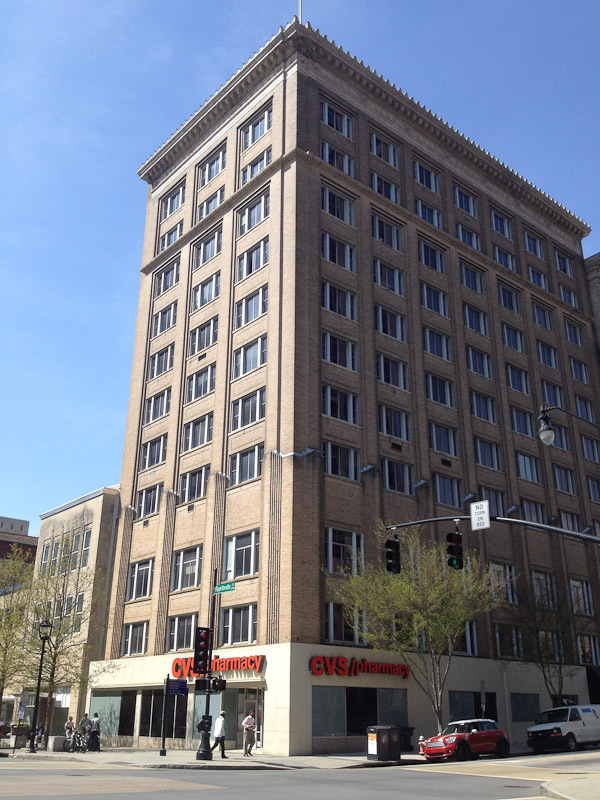 He bought the two adjoining buildings through Paper Clip Properties LLC in July for $700,000 and hopes to turn the ground floor into a restaurant and lease the upper floors for offices. Here’s an older photo of the building and while Goodnight’s work won’t bring it back exactly the same, it gives us an idea of what the team there is uncovering. About a week ago, Josh Shaffer at the N&O wrote a piece about what could be the new icon for Raleigh. He suggests that the now open Nature Research Center‘s 70-foot globe needs consideration for that title. The bronze acorn and the shimmer wall were other landmarks mentioned but I’m going to throw the City of Raleigh flag into the mix. Yes, Raleigh has a flag and in case you haven’t seen it this post will take care of that. The flag should always be considered one of our core symbols and I don’t think we give it enough love. In 2004, the North American Vexillological Association did a survey against 150 US city flags. Respondents answered on a 0 to 10 scale on what they thought were a well designed flags. We ranked 56 on that list, highest North Carolina city by the way, so flag design may not be a huge feather in our cap. Still, I want to ask this question; Why are there so few Raleigh flags around town? The Raleigh flag design is over 100 years old but has an interesting history that may explain it’s rather nonexistent role in our city. The City of Raleigh flag has a nice, mysterious story to it as its original purpose was not made for the city at all. The most influential event on this would be during the Battle of Manila Bay on May 1, 1898 as part of the Spanish-American War. The cruiser would stay in Asia for a bit longer returning back to the United States with a stop in New York in April of 1899. The city sent representatives there for the national welcoming reception for the ship. At the same time that month, the Raleigh Board of Aldermen (what is now a version of our current city council) decided to give a city flag as a gift to the cruiser. A flag had not existed at the time and so began the process in creating one. A special committee was formed for this specific purpose. While Miss Denson was contracted in April 1899, other events with the ship were ongoing. News that the ship would next make a stop in Wilmington, North Carolina quickly spread and Raleigh made big plans for a welcome party in the port city. In addition, there was news that the ship’s officers and crew were going to present “a gun captured at Manila” as a gift to the city. The “Nordenfeldt 3-pounder” was given to the city on May 5, 1899 and then again the day after at a more formal ceremony. Miss Denson’s flag was not ready in time and Attorney R. N. Simms, spokesman for the city, made an announcement at the ceremony that “a handsome flag of the new city colors” would be later delivered. It’s not proven whether the flag ever made it to the ship because the USS Raleigh was decommissioned in June and Miss Denson would complete the flag in October. That month, the 43″ x 69″ flag with gilded fringes all around flew at the North Carolina State Fair. The flag was officially presented to the Board of Alderman on December 1, 1899. Satisfied with her work, they contracted with her for a second flag for the City of Raleigh. No records exist whether this flag still had the Manila Bay reference like the original did. Here’s where the mystery starts to settle in. The USS Raleigh was recommissioned during the periods of 1903-1907 and 1911-1919. No records exist proving the flag ever flew on the ship. In 1938, one of these two flags was lent to the next USS Raleigh (third US ship named after Raleigh) in order to be copied. Upon return, then City Clerk J. E. Sawyer noted that it was “now nearly worn out.” This left Raleigh with one remaining flag. The mystery is now in full effect as no mention or public record of the flag has been found after 1938. Restoring the uncovered flag was an eleven year process and it returned to Raleigh in 1980 where it was on display at City Hall. On the flag’s 100th birthday, 1999, the flag was given to the Raleigh City Museum. 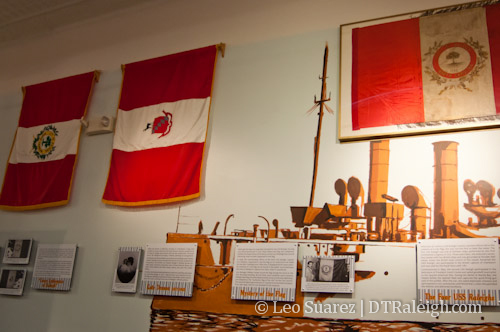 Today, the flag found in 1960 is still on display at the city museum with a recently updated exhibit. Along with much more information than provided here, the exhibit has a nice artist rendering of the second USS Raleigh. So how does one get a copy of our city flag? My research has fallen rather flat as the flag is a custom design and is pretty costly for someone to get through a flag shop. Where’s the local vexillographer at anyway? The city does have a stash of custom made flags for sale in case someone is interested. For $98, you can get a 4′ x 6′ flag to show your pride. Talk to Barbara at the city Public Affairs office (919-996-3001) to make arrangements. Who will be the first to step up and make the Raleigh flag available for the masses? If anyone is interested in city branding, this could be a topic to expand on.